Displays a market bias arrow in the right lower chart corner based on the slope of the EMA(120) of a 3 minute chart to determine the short term bias of the underlining future. 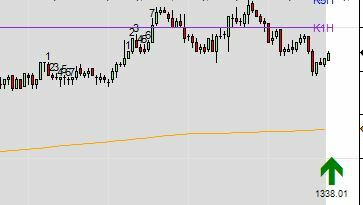 Below the arrow is the price of the last calculated EMA(120). Swing positions should be made in the general direction of the market and this directional arrow can help determine the direction of trades to be taken.